Is your tween or teen considering a babysitting job? Don't let him or her plunge right in. Sure, it's fun to play with babies and small children, but they'll also be responsible for making sure the little ones are safe and properly fed. They'll also have to be sure they're washed, brushed, and in bed on time. Perhaps most important, your child will be the person in charge should an emergency arise. So with all that said, it's important that they understand that the job comes with some significant responsibilities. Of course, your child should always be able to count on you as their parent for help in a crisis. But it's also a great idea for them to enroll in a babysitting class to get the training they need. The Red Cross provides a terrific program offered in many locations, and it's available online as well at a nominal cost. It's a well-established organization with many years of experiencing in preparing children and adults to stay safe, even in unsafe situations. Why take a whole day to learn the skills of babysitting? Unless your child happens to be an older sibling who actively cares for younger brothers or sisters, chances are they know very little about the critical aspects of caring for youngsters. And while some of those skills could be described as "common sense," many actually have to be taught. For example, when is it appropriate to call a parent versus 911? What should they do if a child decides not to obey them? And what questions should they be sure to ask the parents of their young charges? After taking the class, your child will be better prepared to answer these questions and to manage the complicated experience of standing in for parents. Perhaps just as important, they'll be able to include that they have taken a babysitting course when they advertise their babysitting services — and that's something that really appeals to parents. In fact, studies show 8 out of 10 parents are willing to pay more for a babysitter with these credentials. The six-hour babysitting course is designed for 11- to 15-year-olds. Participants leave with a whole set of materials, including a Babysitter's Training Handbook with information and resources to use in class and on the job. Your child will also receive a Babysitter's Training Emergency Reference Guide with instructions on handling common emergencies such as bee stings and asthma attacks. They will also be provided with the tools they'll need to run a successful babysitting business, including a babysitting organizer, and a printable activity booklet with games, crafts, songs, and recipes. There's even a resume template. Hours are flexible and available at various times with your busy schedule in mind. 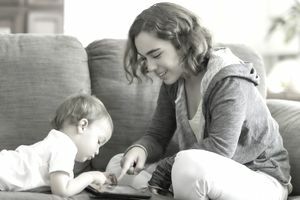 Your child can take the Babysitting Basics course online at home if a classroom-based course isn't convenient or available in your area, starting at just $40. The online course covers the same concepts as the in-person class using a combination of videos and multimedia scenarios. It also includes the same downloadable and printable materials provided in the in-person course. Unlike the in-person course, it takes only about four hours to complete the online course and your child can do it at any time. Both courses include the basics: training on safety, games, maintaining discipline, feeding, and emergency situations, as well as information about how to manage a babysitting business. Beyond that, your child will learn specifics, such as the components of age-appropriate care like changing a diaper. They'll learn first aid procedures, including CPR and AED training. They'll learn what to expect from children behaviorally based on their ages and they'll be instructed on what types of activities are suitable for each. There's even an entrepreneurship angle — they'll learn about professionalism and how to expand their business. When they've completed the course, they'll receive official certification so no one can doubt their skills or where they learned them. A unique ID and QR code allow potential employers to verify her certification. You can contact your local American Red Cross chapter to enroll in an in-person babysitting course. Class dates and fees vary by location. The Red Cross website offers more information on their babysitting course, including contact information for the local chapters. The website also makes it easy to sign up for the online course.